Whilst replacing the right low-beam bulb, the new bulb seems to have disappeared into the headlights assembly!! It doesn't appear that there's enough spaced anywhere for the bulb to have fallen in (checked around on the ground, too). Poked around with a magnetic wand, to no avail. Am I going to have to disassemble half the bike to pull off the whole headlight assembly??? Arghhh!! And just when I'd almost finished!! Re: Where's my headlight bulb? 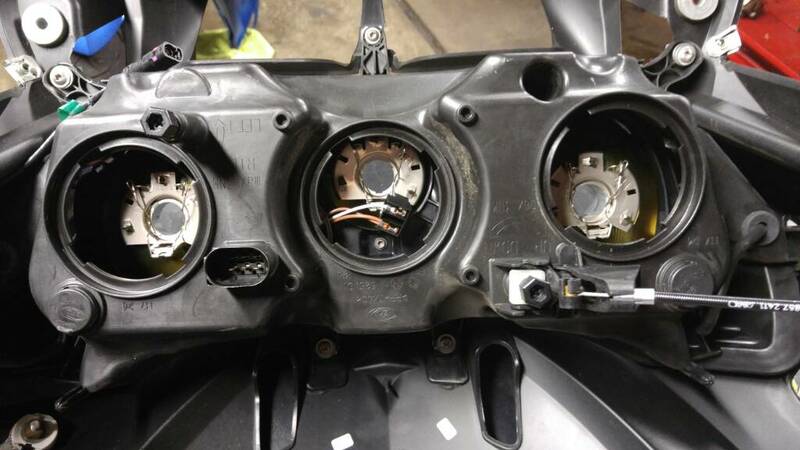 Yes, sure you have to remove left and right trim panels, mirrors, windscreen, instrument cluster, inner trim for instruments, entire top section of fairing, then I think you will see where bulb is without remowing headlight. The BMW bikes are too complicated to turn it around and shake it to drop bulb out. Well, first I'm going to lean the bike over to right onto a chock and see if it slides back. Next step: hit it with a hammer!!! I just can't see enough room for the bulb to have gone anywhere, what with that circular flange at its base. It's like I hired Murphy's law-yer. Thanks. Was the bulb too expensive to leave where it is if it takes no harm? Although this photo is upside down, if the bulb is within the headlight unit (black plastic bit behind the glass), don't see that it will cause any harm or fall out. Is there a flexible bit of tube or something with some double sided tape you could poke around with and hopefully catch it. Or found it somehow attached to something else I had been using to try and install it! The bulb is definite in there, but has resisted all efforts with my flexible magnet wand to retrieve it. I'd originally felt around and thought that it wasn't necessary to stuff cloth, etc. in the openings since they didn't seem to be wide enough for the bulb to fall through. So at least this will serve as a cautionarly tale. I noticed that videos on installing it showed a plastic plug housing both wire leads, whereas my 2005 just has the two separate wires which I attached and attempted to insert the bulb, but the loose wires kept preventing the retaining clip from rotating down into position, so I took them off even tho' it looked like it would be hell to get them on the tangs. Had I kept trying with them attached, it couldn't have fallen thru. I'll have one more go at getting it out and then put in the spare bulb I bought at the same time and put up with the rattling of the loose bulb. Gotta say, it's almost as if they designed the bike to discourage us from doing even these simple jobs ourselves. Thanks for the suggestions. Hi Had the same issue when replacing my running lights, bulb slipped out into the front screen. However being a magpie I had one of these flexible grabbers kicking around the garage. I removed one of the bulbs and inserted this tool to grab the bulb and pull it back up. Might take a bit of wiggling but I retrieved my bulbs without dismantling the headlight unit. I had a fly make its way into my headlight last year, stuck to inside of the glass somehow. An unbent coat hanger wrapped in duct tape (sticky side out) managed to liberate the little blighter.